Alabama’s deer population is relatively young compared to many states. When settlers arrived in the early 1800’s the deer population in Alabama was all but wiped out. The hardships brought on by the Civil War, made deer sightings a very rare event by the time the 1900’s arrived. Things begin to change in the early part of the 20th century though, as the state’s Department of Conservation and Natural Resources began restocking deer in Alabama. They looked first to remote regions in the southwestern portions of the state, and also moved in deer from northern states. Their efforts have proved successful, as the deer herd in Alabama is considered to be in the “overpopulated” range these days. Well over 1.75 million deer is the current deer population estimate in Alabama. The highest Alabama deer density can be found in the southern portions of the state. The good news for Alabama deer hunters of course, is that “overpopulated” means a better chance of taking down a big buck. At the same time, overpopulation is never a good thing over the long haul as deer are faced with fewer resources, and are forced further into towns and cities to find food. Deer are great to view, but not near as great when they are in your flower bed or garden, or worse, colliding with vehicles on I65. Population management is a big key to a deer herds health and quality of life, and deer hunting is a necessary ingredient. Alabama deer rut peaks during mid-November. Alabama deer hunters generally enjoy very nice temperatures and weather conditions during this time, making this state one of the more enjoyable to hunt. Besides great weather, Alabama boasts one of the most liberal hunting seasons, with 100+ days for hunters to take a deer using just about any reasonable means, from rifle to spear. Deer population approaching 2 million. Alabama record whitetail typical deer scored B&C 186 3/8 taken in Lee County in 1986. Alabama record non-typical whitetail scored B&C 259 7/8 with a whopping 36 points, taken in Perry County in 1989. Alabama River Lakes – Over 9000 acres of public hunting land, the majority managed by the U.S. Army Corps of Engineers. Deer hunting is limited to bows and crossbows. For more information, check out Alabama River Lakes site . 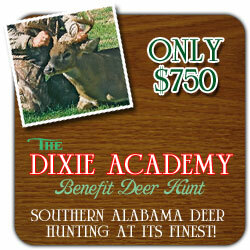 Do you own private hunting land or offer guided hunts in Alabama? Contact us about a listing in this section! For rules, regulations and more detailed information, check out the Alabama Department of Conservation and Natural Resources .